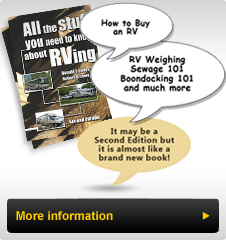 Notes And Updates: The A Weigh We Go seminars are now provided as a service of the RV Safety and Education Foundation (RVSEF). Coach weighing is often provided at Rallies such as those presented by the Family Motor Coach Association (FMCA). While the rates are in the $35 to $45 per weighing session, discounts may be available for FMCA members. With the improved chassis specifications, attention to the weight of the coach as it leaves the assembly line and increased knowledge of over weight issues, the vast majority of RV's have some carrying capacity. It is important for all buyers ansd users of RV's to ensure that the coach has sufficient capacity to carry what they desire to take with them and that it is stored in areas that allow the weight to be distributed in such a way that no wheel position is overweight. When comparing RV's take the carrying capacity into account. Some large coaches are close to their carrying capactiy and have little weight capacity for the 'stuff" to be taken along. The Fall BOA Rally in Paxinos covered many seminars about our Bounders. The following is some additional hints and notes. He has advocated weighing a completed rig at the end of assembly line, however manufacturers are reluctant to install the equipment citing cost, delays, and (realistically) better knowledge that might put them at a competitive disadvantage if some their competitors choose not to do so. Since September 1996 all manufacturers that are members of the Recreational Vehicle Industry Association (RVIA) have agreed to post estimated weights of their production units as they are built. The weight of dealer installed items must be added and John recommends that a purchase be conditional upon the vehicle being taken to a certified scale and weighed so that the load on each tire position is determined. This will tell you how much "room" (carrying capacity) you have and where it is.